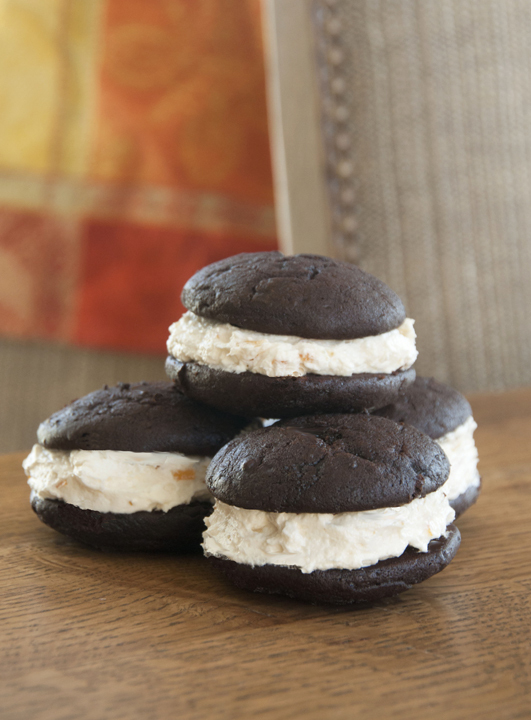 Two saucer-shaped rounds of soft chocolate cake sandwiched around a sweet orange marmalade marshmallow cream filling for a classic whoopie pie. Wash the orange thoroughly. Cut off both ends of the orange. Cut the orange in half, cut each half in about eight sections. Place the orange sections in the food processor and pulse until the peel in is tiny pieces. In a medium saucepan place the processed orange, the water and the sugar and bring to a gentle boil. Boil for 15 minutes, stirring frequently. Let cool, then place in a glass jar with a tight fitting lid. Store in the refrigerator. Make sure it is cold before using. Position a rack in the center of the oven and preheat to 375°. Line two baking sheets with parchment paper or non-stick baking mat. In a medium bowl, sift together the flour, cocoa powder, Brownie Brittle, baking soda and salt. In the bowl of a stand mixer fitted with the paddle attachment, beat together the butter, shortening, and brown sugar on low speed until just combined. Increase the speed to medium and beat until fluffy and smooth, about 3 minutes. Add half of the flour mixture and half of the milk to the batter and beat on low until fully incorporated. Add the remaining ﬂour mixture and milk and beat until combined. Drop tablespoons of batter onto the prepared baking sheets at least 2 inches apart. Bake one sheet at a time for 9-10 minutes each, or until the rounds spring back when pressed gently. Remove from the oven and let the cakes cool in the pan for 5 minutes before transferring them to a rack to cool completely. In the bowl of a stand mixer fitted with the paddle attachment, beat together the marshmallow fluff and the vegetable shortening, on medium speed until the mixture is smooth and fluffy, about 3 minutes. Add the confectioners’ sugar, orange marmalade, and the vanilla and beat on low until incorporated. Increase mixer speed to medium and beat until fluffy, about 3 minutes more. Using a knife or spoon, spread the filling onto the ﬂat side of a cooled cake. Top with another cake, flat side down. Repeat with the remaining cakes and serve.